The first ever computer virus spread by mobile phones has been sent to anti-virus firms. No infections have been reported and the worm is harmless but it is proof that mobiles are at risk from virus writers. The worm, known as Cabir, infects phones and devices running the Symbian operating system. Anti-virus firms are divided on whether it will open the floodgate to similar viruses. "It is a milestone in the timeline of viruses but technically is not that special," said Graham Cluley, a senior technology consultant at Sophos Anti-Virus. 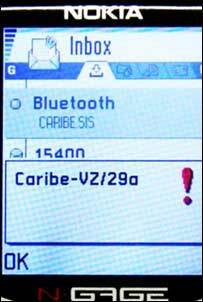 When the infected file is launched the mobile phone's screen displays the word "Caribe". Every time the mobile phone is turned on, the worm will launch itself and scan the area for other phones to infect, sending a copy of itself to any it finds. Mr Cluley sees it as an interesting first rather than something that needs to be of great concern to phone users. Because the worm requires Bluetooth technology to travel, it is geographically constrained to a radius of about 30 metres. Then it is dependent on someone having Bluetooth turned on within that range. And as a final blow to its progress, any unsuspecting phone user in the vicinity would have to accept the virus which would be preceded by a warning that the source of the file is unknown. Anti-virus firm F-Secure was among a handful of security companies to receive the virus, which it believes to have come from a group of virus writers known as 29a. The group is credited with the release of the recent Rugrat virus. Will mobile users be plagued by viruses? "This group don't tend to write malicious viruses, rather it is a proof of concept thing," said Matt Piercy, UK manager of F-Secure. "But there is a history of their code getting into others' hands and I would not be surprised to see the first attempt at something more sinister in the next few months," he added. A malicious mobile phone virus could wipe contact numbers and other data stored on the handset, as well as sending out messages purporting to come from the victim's phone. "People need to take this seriously and in the same way as we protect our PCs, we need to protect our mobile phones," said Mr Piercy. This would involve users downloading a firewall onto their handsets. Not all anti-virus firms are convinced that a glut of mobile viruses is likely in the near future. "We spotted a virus written for a Palm device four years ago and some anti-virus firms predicted a flood of others but it just didn't happen," said Mr Cluley. Instead, Windows will be the primary target for virus writers for the foreseeable future he predicts. One such virus, the Zafi-B worm, is currently infecting 90 out of every 1,000 emails being sent according to Sophos. "That is an astonishing figure and is by far the most widespread e-mail virus at the moment," said Mr Cluley. The worm displays a message demanding the death penalty be introduced in Hungary.